French style open arm chairs (also known as 'provincial' or 'fauteuil') commonly serve as accent or occasional seating in today's homes. Their smaller proportions and light weight style balance more substantial furnishings in entrance, living and family areas. Many folks inquire about the reupholstery cost for these chairs. So we grabbed a few recent projects from around the New Jersey area to shine some light on the issue. A theme of bronze, soft grey and softened whites inspired the design decisions for this personalization of a new home in Glassboro NJ. The major furnishings and artwork anchored the look. Accents would wrap the design elements. She had a pair of French style open arm chairs in a traditional style. Walnut finish with damask fabric. Strongly traditional. Looking for something more upbeat, she selected a contemporary fabric by Barrow - Lucinda Driftwood. 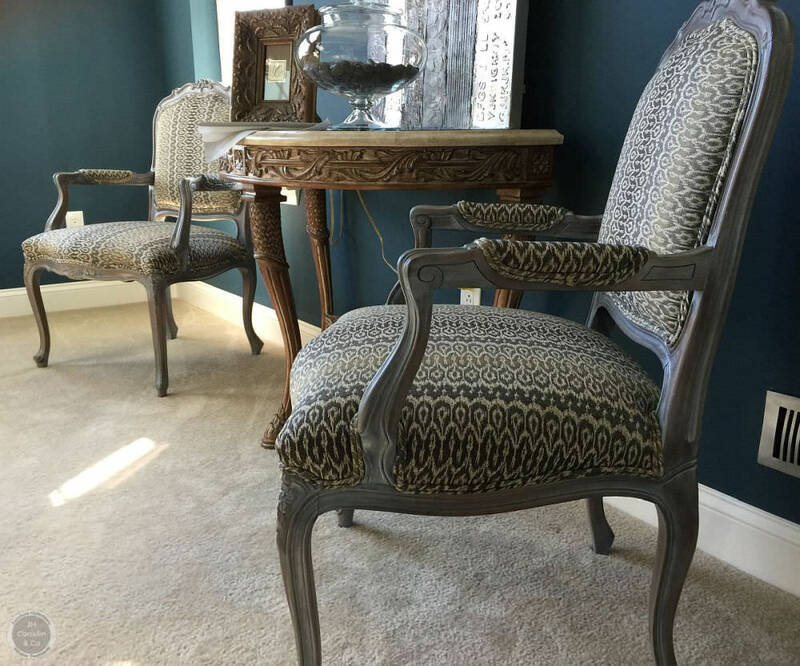 To augment the fabric, we worked up a frosted glaze finish before reupholstering the chairs. The result of balancing the frame finish with the fabric gave a very subtle contemporary look to the chairs. "You guys are one of the area's best kept secrets! I thought it was going to be much harder to get what I wanted. You made it easy." "I need some side seating in our family room. I have two French style chairs from my mom's place that are the right size. But I need some pop in the room against all the stone and neutral/natural tones I have going on." The chairs were anything but 'pop' when we saw them. And the finish was flaking and scratched. She ended up with two accent fabrics: one from Greenhouse and one from Robert Allen. While she was deciding, we cleaned up the frames. The end result was a different 'pop' depending on which way you viewed the chairs. Fresh, strong, bold!